Many of the open questions in particle physics are related to neutrinos. One of those is the deficit in the observed number of anti-neutrinos produced by nuclear reactors with respect to the predicted number. To explain this anomaly theorists hypothesized a new fundamental particle, the so-called 'sterile' neutrino. This sterile neutrino does not interact with matter like ordinary neutrinos. If it exists, its presence could be inferred from the variation of the detected number of anti-neutrinos as a function of their energy and travelled distance from the reactor, i.e. through the measurement of the oscillation parameters. From the best fit, the oscillation should be maximal for distances below 10 m.
The SoLid experiment is an anti-neutrino detector capable of accurately measuring both the position and energy of each interacting anti-neutrino. This detector is placed next to SCK-CEN's BR2 reactor in Mol, Belgium, at a distance of only 6.2 m at the detector's point of closest approach. This close distance to a nuclear reactor and the operation at ground level poses significant challenges to the sensitivity of the experiment because of the high levels of background (radiation from the reactor as well as cosmic rays) and the low interaction probability of the reactor anti-neutrinos in the detector. Anti-neutrinos interact with the detector material via inverse beta decay interactions, producing a neutron and a positron. It is the coincidence between these two particles that indicates the presence of neutrinos. The SoLid detector is a voxelised hybrid solid scintillator detector. 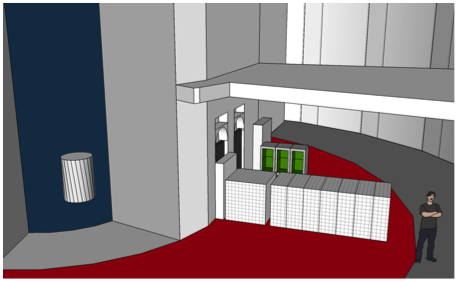 The voxelisation into cubes allows for the determination of the interaction position of the anti-neutrino. The use of solid scintillators is new in the field and led to an extensive commissioning period for the detector using a real-scale prototype called SM1. Based on the findings with the prototype, the design was optimized, in particular to obtain a better light yield, an improved neutron capture efficiency and a better trigger. The results obtained with this protoype are summarized in https://inspirehep.net/record/1653952. At the end of 2017 and the beginning of 2018, the Phase 1 SoLid detector was installed at the BR2 reactor in a cooled container. Since then, it is operating and collecting data stably. The SoLid experiment is expected to resolve the reactor anti-neutrino anomaly within a time scale of 3 years. The official webpage of the SoLid collaboration can be found here http://solid-experiment.org/.